Visual test models and state transition diagrams are two means of visualising information. Though they may appear similar at a glance, the structure and purpose of each is unique. When used in software testing, they act as tools to guide entirely different test techniques. This article compares these two types of visualisation in the context of a real-world example based on purchasing a book from e-commerce retailer Amazon. Testing often begins by focusing on function first. Sometimes this is because testing is being driven by a requirements document or the acceptance criteria of a user story. Sometimes it’s because not all of the functionality is present in an iterative delivery model, so the testers have to concentrate on one piece at a time. Sometimes it is just due to personal preference. A visual test model begins as a useful way to quickly capture the things that a product can do, acting as a note taking tool during investigation of a function. Once the visual test model shows what the product can do, it can then be used to capture how the tester could know whether each function was capable of working. 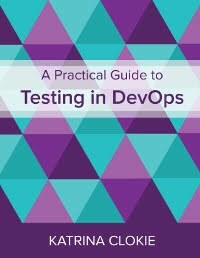 Test ideas are added to each branch and might include negative tests – those ideas that determine that the function doesn’t do things that it shouldn’t. From this point the continued use of the model will vary dependent on the test approach. It may be extended to show exploratory test sessions and progress of testing. It may drive discussion around which ideas are suited to automated checking. It may be used as a reference to create pre-scripted test cases in a test case management tool. A visual test model is a good way to capture quick thinking about what a product can do. It is a simple mechanism to capture test ideas that drive function testing. Once the pieces of the product have been functionally verified, the tester will want to examine how they interact together. 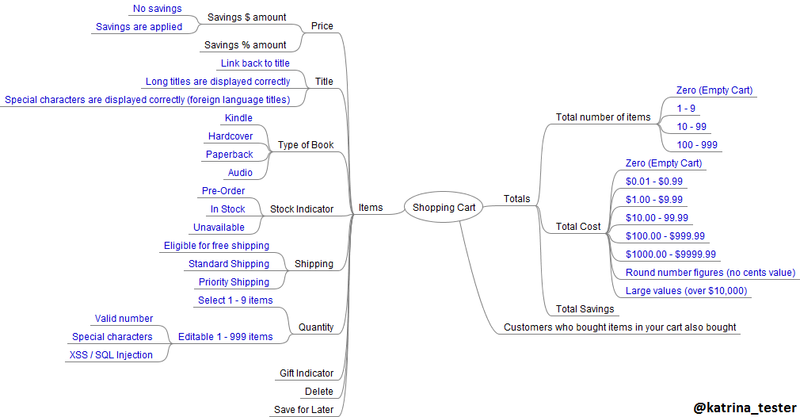 The shopping cart, the checkout and the order review page may all work in isolation, but unless they also integrate correctly with each other a customer will not be able to purchase a book. 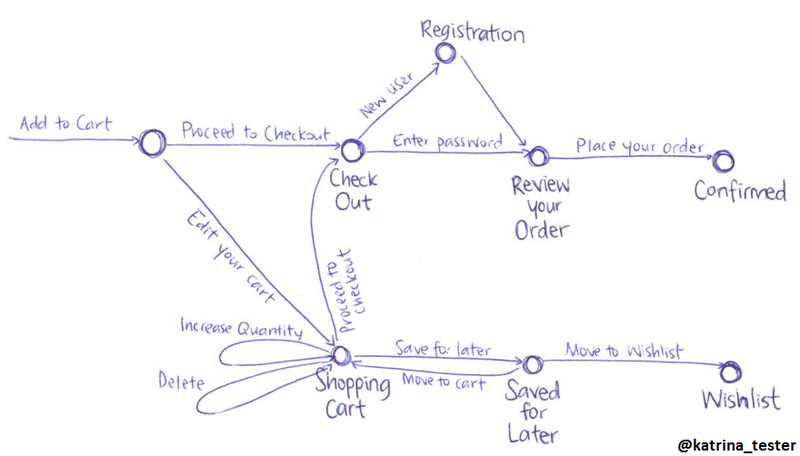 State transition diagrams offer a way to visualise paths through a product. Determining how activities are connected end-to-end will help the tester to identify varied flow through the application that may otherwise have been missed. Because the state transition diagram is focused on interaction, it is a good visualisation for flow testing. Traversing the diagram through varied paths, while adopting different timing and number of users, is a good way to explore a piece of software through a different lens. Great post! This is one of most practical examples I've seen so far. Thank you for sharing Katrina!